We the Indigenous People of Biafra (IPOB) view as laughable the latest attempt by the Nigerian secret police DSS to rescue one of their sinking Igbo slave in the person of Okezie Ikpeazu by seeking to deflect attention with the concocted, faceless, non-existent 'Okwudili' they claim is heading a 'faction' of IPOB. Hausa Fulani Arewa North and their slaves in Igboland, of which Okezie Ikpeazu and Nnia Nwodo are most prominent, even more than Rochas Okorocha, are misguided into thinking the great global IPOB family can be fooled by such kindergarten tactics of planting names in the public domain and claiming the person is IPOB leader. DSS as a spy agency should work harder at infiltrating IPOB because all their efforts so far have failed miserably and will continue to fail because we are the most disciplined mass movement anywhere on this earth today. Parading what is in effect a ghost as fake IPOB 'leader' to give the impression that IPOB is divided is a wretched joke long anticipated by the highest command of IPOB four years back and something we knew would happen, so we are prepared for it. Therefore it did not come to us as a surprise when this morning DSS hurriedly issued their usual 'Okwudili' press statement to the media to limit the fatal blow IPOB dealt Okezie Ikpeazu by simply stating the truth through our press statement yesterday that countered the lies he was spewing. The public must understand the tricks and propaganda strategy of DSS. Any time this APC regime is in trouble with their image, they fabricate false high propaganda value news and blackmail, cajole or bribe media houses to carry it, so public attention will be deflected from the real issue/s. Remember the timing of the release of Chibok girls in 2017. Is it not a coincidence that this DSS generated press statement, attributed to a faceless nonentity they named 'Okwudili' claiming he is IPOB leader, came out on the day Amnesty International published their report confirming that at least 12 people were shot dead at the home of our leader on Afaraukwu Umuahia on 14 September 2017? That is the extent this deceptive Buhari regime is prepared to go to confuse the weak and gullible. Okezie Ikpeazu in less than 3 years in office, supervised five well known massacres of innocent men, women and children in Abia State, from which he will never escape justice, for he will be punished severely at the appropriate time. We knew Okezie Ikpeazu's Hausa Fulani masters will come to his rescue and today they have done exactly that by using our hallowed name to seek to exonerate him. This move is too little, too late for them. Anybody who is remotely interested in knowing how ridiculous this whole fabrications are should remember similar attempts in the past by DSS to give the impression that IPOB is divided which came to nothing. 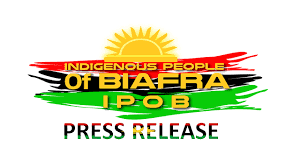 This present Nigerian government in the past have floated RE-IPOB, TRIPOB, CG-IPOB and many more on the pages of newspapers, in the hope of attracting money hungry Igbo traitors to destabilize IPOB and betray Biafra but all their efforts failed. They floated a radio station in the US called Radio Biafra International which failed to take-off till date, that attempt to replicate the world famous Radio Biafra was what caused IPOB to launch Radio Nigeria Hausa Service. Okezie Ikpeazu, Nnia Nwodo and other traitors must know that lies and deception can never help their cause of exchanging our blood for money and political relevance in Nigeria. The same way Buhari doesn't exist in Aso Rock is how there is no 'Okwudili' leading IPOB. If this fake person does exist, how come there is no picture of him anywhere, he doesn't address any gathering, he has no village, no parents, nothing. He is a mirage, a figment of the imagination of DSS and corrupt Igbo leadership. 'Okwudili' we know for sure exist in DSS computer hard drives and no place else. From there they move him to the pages of newspapers for a few hours and the name vanishes. Anybody who allows him or herself to be deceived by this childish antic from DSS might as well believe Jubril at Aso Rock today is Buhari or that Naira notes is the main diet of snakes and monkeys. IPOB is one indivisible family under God. No man born of a woman is capable of dividing IPOB. If you claim you are Mazi Nnamdi Kanu's replacement, please come out let's see you, after that then come down to Biafraland and address us. EMMA POWERFUL MEDIA AND PUBLICITY SECRETARY FOR IPOB.